That's right, the 08 Sinister DNA has arrived!! Some of the proud new owners have been posting some sweet builds on the Sinister Bikes Forum, so check them out. 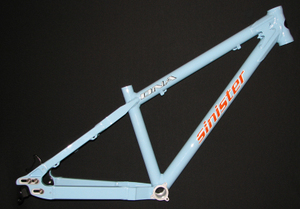 As always, check out sinisterbikes.com for ordering information or contact your local authorized Sinister Bikes dealer for more information. Stay tuned for some DNA builds here and on the forum. From the projects inception to today, the DNA has evolved into a single purpose “Starmaker” for the park and jump scene. Pioneering geometry and innovative features make this bike the tool of choice for aggressive riding individuals who are sure of their direction in life and riding discipline. Designed in complete triangles from round tubing (structurally superior engineering) the DNA positions the saddle between your knees for control and the top tube low for step-over tricks. Fear not the 50/50 landing when your gentle chromosome grabs the brakes. The heavy wall domestic 6061-T6 tubing with industry leading 38 mm (1-1/2") seat tube will keep your bike and carcass in one piece. The Sinister DNA won’t let you down, rat you out or sleep with your friends. Get one. Progress.